Your day-by-day itinerary now includes Mariposa Grove of Giant Sequoias, Tenaya Lake, Bridalveil Fall, and other attractions you added. On the 30th (Fri), take some stellar pictures from Tunnel View. 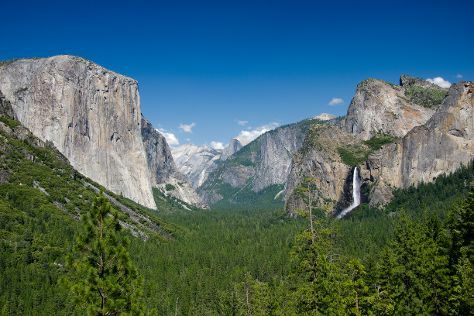 Get ready for a full day of sightseeing on the next day: take in the dramatic scenery at Yosemite Falls, admire the sheer force of Vernal Fall, get great views at Valley View, then take in the dramatic natural features at El Capitan, and finally stroll around Mariposa Grove of Giant Sequoias. For where to stay, maps, ratings, and tourist information, use the Yosemite National Park online attractions planner . San Francisco to Yosemite National Park is an approximately 4-hour car ride. You can also do a combination of flight and car; or do a combination of flight and bus. When traveling from San Francisco in August, plan for a bit warmer days in Yosemite National Park, with highs around 81°F, while nights are little chillier with lows around 43°F. Cap off your sightseeing on the 2nd (Mon) early enough to catcht the bus to Sequoia and Kings Canyon National Park. With mountain peaks reaching past 4,250 m (14,000 ft) and trees stretching to over 75 m (250 ft) high, Sequoia and Kings Canyon National Parks present nature on a grand scale. You've added Grant Grove, Zumwalt Meadow Trail, Crescent Meadow Rd, and other attractions to your itinerary. Kick off your visit on the 2nd (Mon): explore the wealth of natural beauty at Kings Canyon National Park, trek along Zumwalt Meadow Trail, then take a peaceful walk through Grant Grove, and finally admire the sheer force of Grizzly Falls. On the 3rd (Tue), you'll have a packed day of sightseeing: stroll through Moro Rock, then trek along Crescent Meadow Rd, then make a trip to General Sherman Tree, and finally trek along Lakes Trail in Sequoia National Park. For photos, maps, other places to visit, and other tourist information, read Sequoia and Kings Canyon National Park trip app . You can take a bus from Yosemite National Park to Sequoia and Kings Canyon National Park in 7 hours. When traveling from Yosemite National Park in September, plan for somewhat warmer days and warmer nights in Sequoia and Kings Canyon National Park: temperatures range from 90°F by day to 59°F at night. Wrap up your sightseeing on the 4th (Wed) early enough to travel to San Francisco. Your day-by-day itinerary now includes Japanese Tea Garden, Lands End and Muir Woods National Monument. You'll explore and learn at Exploratorium and Asian Art Museum. Take a break from the city and head to Alcatraz Island and Twin Peaks. It doesn't end there: take in the views from Golden Gate Bridge and take a leisurely stroll along Fisherman's Wharf. For ratings, more things to do, traveler tips, and more tourist information, go to the San Francisco trip itinerary builder website . You can fly from Sequoia and Kings Canyon National Park to San Francisco in 5 hours. Alternatively, you can take a bus; or take a train. Traveling from Sequoia and Kings Canyon National Park in September, expect nights in San Francisco to be about the same, around 58°F, while days are a bit cooler, around 76°F. Finish up your sightseeing early on the 7th (Sat) so you can travel back home.